Outdoor and indoor roller shades at Houston Blinds For Less provide a modern and sleek way to keep the sun’s rays from heating up a room in your home or office. Also known as roll up or roller blinds, roller shades are very simple to operate, raising and lowering with a smooth motion. An optional feature includes motorization, excellent for controlling multiple shades in a room. As versatile as they are functional, our Houston roller window shades make great indoor or outdoor blinds and are perfect for both residential and commercial applications. Roller shades and blinds at Houston Blinds For Less are ideal window coverings for offices, schools and store fronts as well as homes. We offer an extensive selection of premium roller shades from top named brands, such as Hunter Douglas, Levolor, Bali, Mariak, and Mecho Shades, a manufacturer specializing in custom roller shades, including oversized and automated, motorized shades. If you want to block all light coming into a room, consider room darkening roller shades. 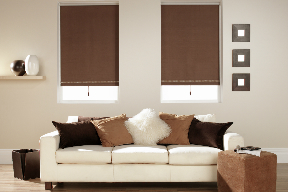 These blackout roller shades, ideal for rooms facing the sun, are available in a wide range of colors and shades. Maybe you would rather preserve your outside view while blocking the sun’s penetrating UV rays. In that case, install light filtering roller shades. These shades are available in a wide selection of color fabrics. 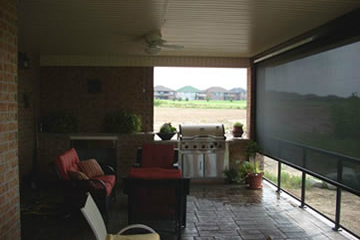 Custom outdoor roller shades at Houston Blinds For Less are specifically manufactured to endure outside weather conditions. Excellent for patios and porches as well as the exterior of rooms and offices, sun screen exterior roller shades are available in multiple colors. Contact Houston Blinds For Less today and you can get a free, in-home or office consultation with one of our expert representatives. See the types of roller shades available, including color and fabric options, and select the best window shades for your needs and décor without pressure to buy more. Don’t wait – call (281) 997-2100 now.